A pre-poll survey predicting the outcome of the Karnataka Assembly polls has created an upheaval in the state’s political circles. The survey supposed to have been conducted by an unknown agency by the name of CHS has estimated the seat allocation as follows; Congress-77-81 seats, BJP-73-76 seats and JD(S) – 64-66 seats. 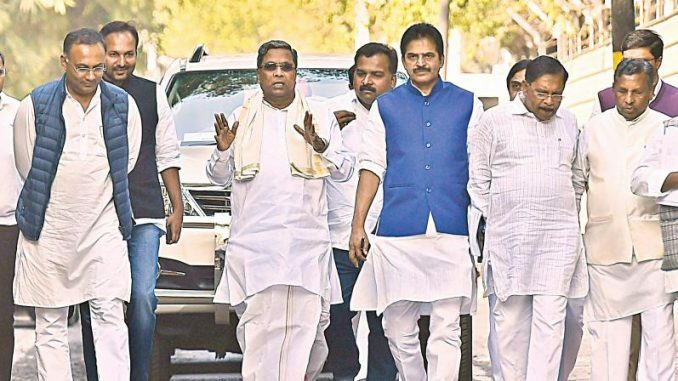 With the predictions indicating a hung assembly, the agency has directed both the Congress and BJP to put in extra efforts if they want to supersede the other. The survey prediction was circulated on Sunday to many WhatsApp groups that included politicians. The last observation seemed to suggest that state congress President, Dr G Parameshwara who is a Dalit must be involved in the survey. He however, reassured the Siddaramaiah camp that he had no hand in it and filed a complaint against CHS with cyber cell of the police. He further told the party cadres not to get affected by such surveys as according to him the Karnataka Assembly polls would be won by the Congress. The Gowdas were later suspected of being involved in the circulation of the survey; however, this claim was strongly refuted by former Prime Minister and JDS chief, HD Deve Gowda who too stated that they would in fact sweep the polls with a full majority. The survey was also rubbished by BJP’s BS Yeddyurappa, who was confident of their party winning the polls on their own. With all having raised their hands of being involved in the survey, the mystery of the survey’s origin still continues!